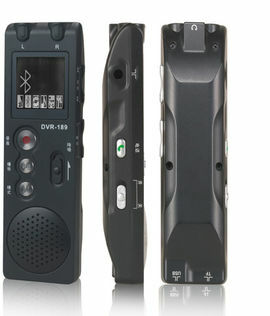 The VR4GBPro is a professional grade telephone and cellphone voice recording device*. This device even includes dual microphones and noise reduction for crisp and clear audio recording. Simple set up. Plug into a wall jack and pick the recording quality mode that suits the situation. Set it to automatically answer, and you can go about your day or listen in with the included earbuds. Adjustable quality settings. Manage the trade-off between quality and recording time when choosing between extra high quality(SHQ), high quality(HQ), standard quality(SP), and long play(LP). The long play mode can store up to 283 hours (a bit longer than 11 days) on the 4GB internal storage. Several recording options. Set a timer for automatic recording at a specific time, or set to voice activation mode. Built-in Bluetooth. Allows for easy cellphone recording via Bluetooth Sync.